VVDI MB BGA TooL Benz Key Programmer Plus EIS/ELV Test Line and NEC Key Adaptor ,bundle package for sale. Support all key lost W210,w204, w207,W166, W246, W212, W212(old),some W216, W164 2009- and some others. Package includes NEC key optional adapter,and EIS/ELV Test line cables. VVDI MB BGA Tool with VVDI MB NEC Key Adapter, support read v51 v57 key password directly. 1.Get the key chip from key,and put on the NEC key adapter. 2.Connect VVDI Benz with your car and computer,start vvdi benz software. 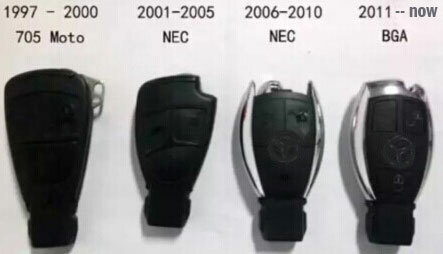 3.Click 'Read/Write Key',choose NEC model,and choose V51,V57.Then click "Identification Key",reading data successfully. 4.After step 3,click "Read V51,V57 key password". 5.Then it will display key password,please save the key password.